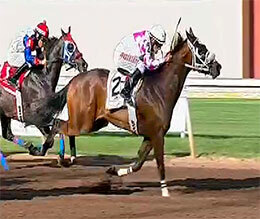 Bout Tree Fiddy, under jockey Larry Payne, winning the $50,000 Jack Brooks Stakes on Sunday at Remington Park. OKLAHOMA CITY, OK�MAY 29, 2017�Last year's Rocky Mountain Futurity winner returned to the winner's circle on Sunday when he defeated V Power by half-a-length in the $50,000 Jack Brooks Stakes for Oklahoma-bred 3-year-olds at Remington Park. Carters Thunder finished a neck back in the show position. Ridden by jockey Larry Payne, Bout Tree Fiddy completed the 350 yards in :17.724 seconds to pick up the winner's purse of $29,784. Trainer Patrick Swan saddled the multiple stakes winning son of IVORY JAMES for himself and Carry "Rusty" Allred. The homebred is out of Hollie Jollie by Fredricksburg. Bout Tree Fiddy entered the race off a fourth-place effort in the Mr Master Bug Handicap on April 23. He has compiled an (11) 3-2-2 record and earned $116,658. Saddled by trainer Dustin Cox, V Power was second best for owner CoCoMo Racing LLC. G.R. Carter, Jr. rode the Valiant Hero 3-year-old bred by Weetona Stanley and W.E, Smith. Out of the Mr Jess Perry mare Ferarri First Prize, V Power earned $9,928 to boost his earnings total to $277,267. Carters Thunder, a Carters Cartel gelding, races for owners Juan Oropeza and Cuadra Ladrilleros Ltd Co. Stuart Steele trains with Jesus Salazar getting the riding assignment. Bred by R.D. Hubbard, from the Strawfly Special mare Lady Bonafide, Carters Thunder earned $5,461 for his third-place effort. Dark Tint, Dancing Capo Decapi, Barue, Senator Teller, As And Js and B Double U completed the field. In other state-bred stakes at Remington Park Monday the IVORY JAMES filly Streaks Of Ivory finished second in the $61,800 FL Lady Bug Stakes for 2-year-old Oklahoma-breds. Streaks Of Ivory was a game second for owners Jon and Brant Barley and trainer John Weghorst. James Flores rode the 2-year-old filly out of Streakin Rare by Fredricksburg. Bred by Michael Teel, the multiple stakes-placed filly earned $11,360.